Solitons, or large pulses of water that appear to travel without distortion in the open ocean for many miles, were first observed in England in 1834. They were first seen from space by Vance Brand on the Apollo-Soyuz mission in 1975. Oceanographer-astronaut Paul Scully-Power and other crewmembers saw a dramatic example of ocean solitons propagating from the Strait of Gibraltar on STS 41-G in October 1984. 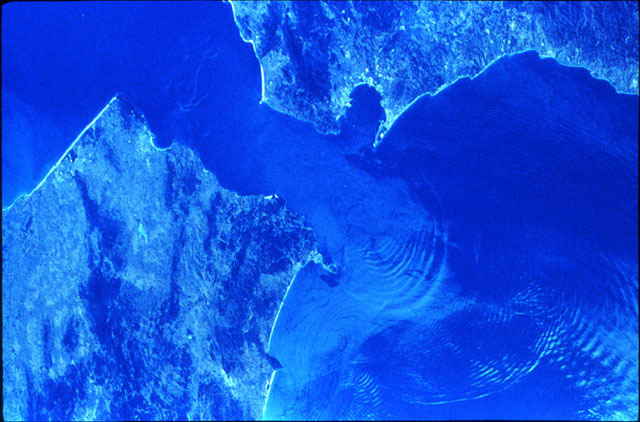 In this frame from STS 41-G, Gibraltar appears at the top right of the passage through the Strait of Gibraltar. Ceuta, on the tip of Morocco, is located about 30 kilometers to the south. controlled from the Earth, and the second EVA included an investigation of several craters and the Surveyor 3 spacecraft. This soliton packet is triggered by inflowing Atlantic water accelerated by its passage through the narrow Strait and across the sill at the entrance to the Strait. At the interface between the fresher, lighter Atlantic water and more saline, denser Mediterranean water, internal wave sets are generated, usually at a depth of about 60 to 80 meters. Each soliton develops independently as the tidally driven, eastward flowing water is compressed and upwelling results. When the tide turns, upwelling does not occur as water flows back through the Strait, and no solitons are produced. In this photograph, a series of solitons produced by the eastward-flowing tide is followed by a stretch of structureless water where no solitons have been produced after the tide has turned. Three 24-hour tidal cycles are visible in this image, with about 60 kilometers separating one series of solitons from the next.